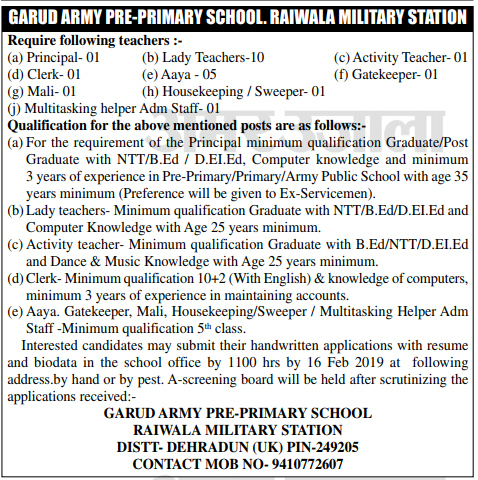 Garud Army Pre-Primary School, Raiwala Military Station Dehradun has released notification for the recruitment of Principal, Teachers, Clerk, Aaya, Gatekeeper, Mali, and Housekeeping/Sweeper & Multitasking Helper Adm. Staff. Total No. of Post is 22. Interested and Eligible Candidates may submit the application form with resume and biodata in the school office by 16 Feb 2019. Principal 01 For the requirement of the Principal Minimum Qualification Graduate/Post Graduate with NTT/B.Ed./D.El.Ed., Computer Knowledge and min. 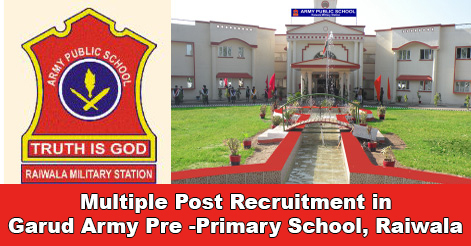 3 years of experience in Pre-Primary/Primary/Army Public School with age 35 years min. (Preference will be given to Ex-Servicemen. Lady Teachers 10 Min. Qualification Graduate with NTT/B.Ed. /D.El.Ed. And Computer Knowledge with Age 25 Years minimum. Activity Teachers 01 Min. Qualification Graduate withB.Ed./NTT/ D.El.ED. And Dance & Music Knowledge with Age 25 years minimum. Clerk 01 Min. Qualification 10+2 (with English) & Knowledge of computers, min. 03 years of experience in maintaining accounts. Aaya 05 Min. Qualification 05th Class. Selection of the candidates will be based on the Performance in Interview. A screening board will be held after scrutinizing the applications received. Interested candidates may submit their handwritten applications with resume and bio-data in the school office by 16 Feb 2019 till 1100 hrs. at the following address by Hand or By Post. Last Date of Submit Application form: 16 Feb 2019 till 1100 hrs. Help us to improve this article/job posting "Teaching & Non-Teaching Staff Recruitment in Garud Army Pre-Primary School, Raiwala Dehradun". We would be glad if you can comment below and provide your valuable suggestions and feedback. If this page have any wrong information/list or out of context content, then you can report us as well. helo Mam/Sir hindi typing is must for clerk or not. Hello Neeraj, Please feel free to call on the Given no. of office for any details about the recruitment. Hello Arun, aapko blank paper me khud se apni details likh kar..apne resume and biodata k saath school me submit krna hoga. 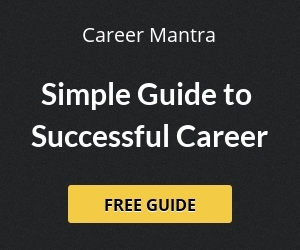 What is the salary of clerk’s job? Hello dear admin sir plz tell us this is permanant govt job or cotractual basis job ..plz plz plz clear …. What is the Salary offered to teachers?? Is this job is permanent?? Dear sir/ madam im pankaj kumar im 12th pass. Mujhe computer ki besic ka knowledge hai. Or mujhe office ka paper work, record handling ka 5 year ka exp. Hai. Aap plz mujhe conform kar sakte hain. Thank you.